Anglers took advantage of a calm but cold day to head offshore. Fishing was good but catching was another story. 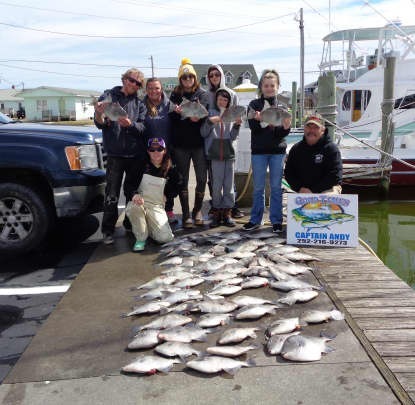 Bottom fishing was good with Triggerfish and Black Sea Bass keeping anglers reeling. 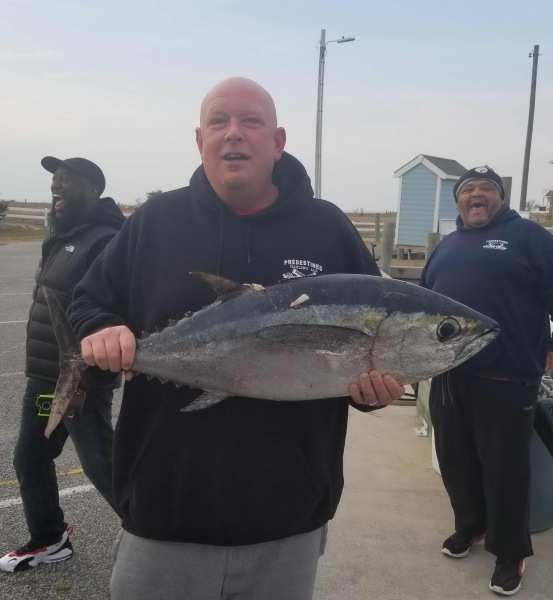 One charter headed north and released a 93" Bluefin Tuna and saw evidence of more that failed to bite the hook. A northeast wind is supposed to blow hard tomorrow with rain coming in tonight and continuing through Sunday. We had one boat to head offshore despite a breezy north wind this morning. 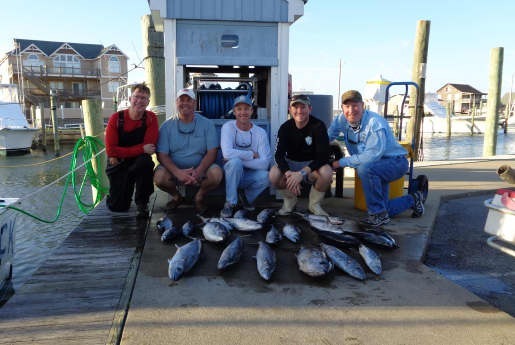 They caught some King Mackerel and Albacore before heading up north and landing Yellowfin Tuna. March came in like a lion and continues to roar! We are definitely ready for it to go out like a lamb. It's time to soak up some warm Spring sunshine and to get rid of the cold north blow. We have been booking inshore and offshore charters as many people are getting antsy to get outside and shake the blues. Give us a call at 800-676-4939 and book the charter of your choice! Several boats out fishing on a nice calm day with warmer temps. Excellent catches of Wahoo with Yellowfin Tuna mixed in. There were good catches of bottom fish with Amberjack, Triggers and Vermillion Snappers. Release: Seth Travis of Lexington, SC caught a 45lb Wahoo. Ross Travis of Lexington, SC caught a 5lb Triggerfish. Weather was interesting overnight with a brief hailstorm and lots of thunder to go with it. Winds continued to rock this morning and all boats stayed in. Some great stuff coming into the marina so we are staying busy getting it all ready for you. 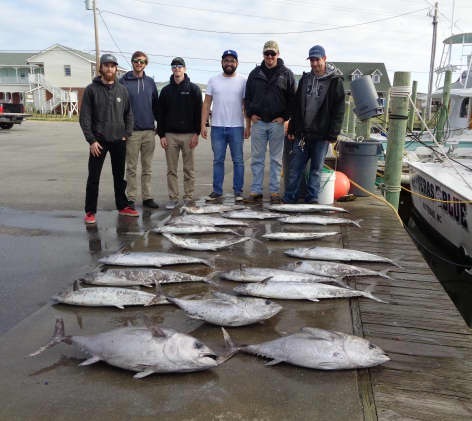 Check out the trophy Bluefin Tuna caught by one of our boats this last week. Its a beast at 90". Happy St. Patrick's Day! 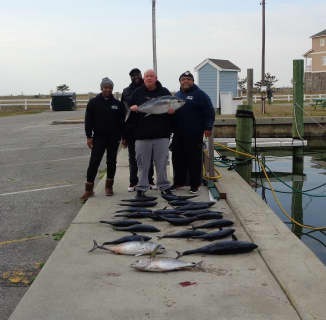 The wind finally shifted to the south overnight and a couple of charters were able to fish offshore. 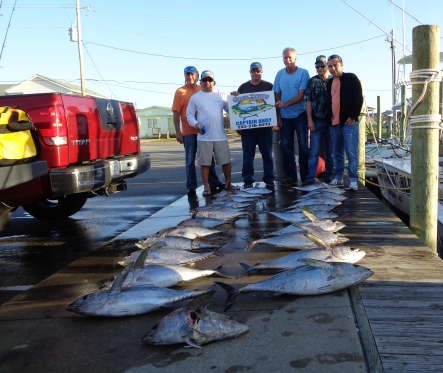 They mainly focused on bottom fishing and returned with a great catch of Triggerfish and scattered Amberjack. Rain is supposed to move in for the next couple of days followed by yet another nor'easter. March has been quite a month for weather and we're hoping for some nice Spring-like conditions soon! We offer inshore, near shore, and offshore fishing excursions - give us a call at 800-676-4939 and book the trip of your choice. Another gorgeous day to be out and about on the water. 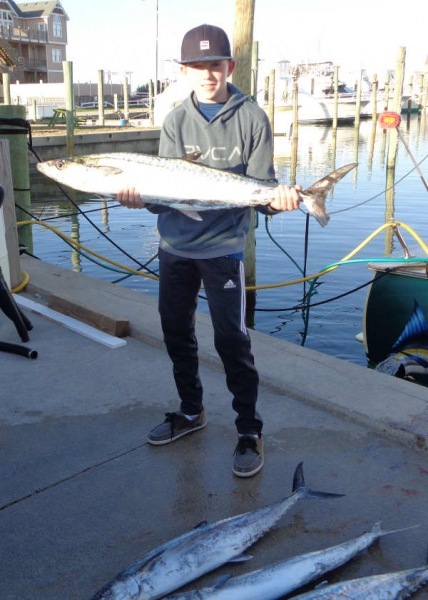 Inshore anglers had a great time catching Bluefish and Spanish Mackerel on half day trips in the Pamlico Sound. Two Sailfish were released by our offshore fleet. 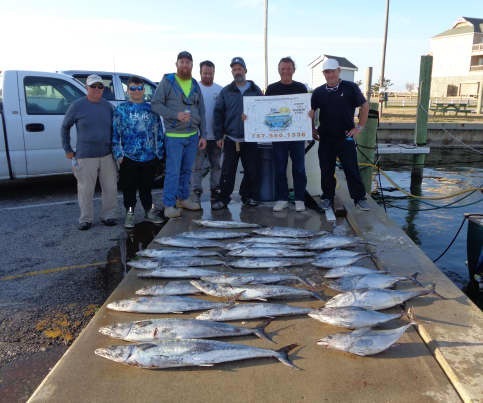 Anglers also returned with Wahoo and Blackfin Tuna. The Dolphin bite was scattered and bottom fishing was good. Everyone had a great time and got some good eats as well! The past week on Hatteras Island has been interesting! The storm began with flooding from the soundside, then followed by flooding from the oceanside. Needless to say we were inundated with water from all sides. We finally had a couple of charters head offshore today and they reported slow fishing conditions. There was a good Albacore bite with scattered Blackfin Tuna thrown in. Hopefully the weather will settle down and we can get out some this week. 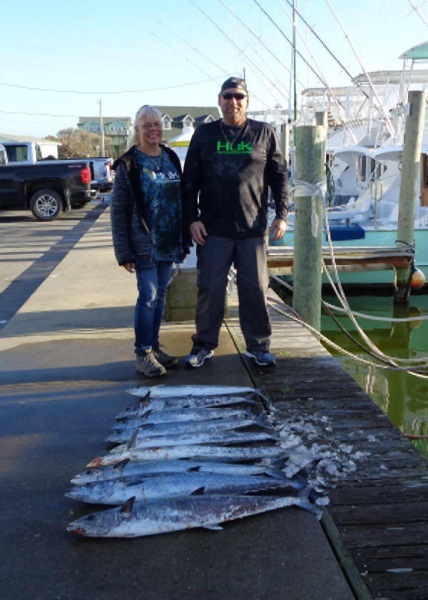 We offer inshore, near shore, and offshore charters, give us a call at 800-676-4939 and we'll be glad to hook you up! James Norris of Hampton, VA: 26 lb. Blackfin Tuna on Carolina Girl. It's hard to believe that February has come and gone. Maybe March will bring us some Spring-like weather - after the nor'easter that's suppose to finish out the week. Lots of action to report today. 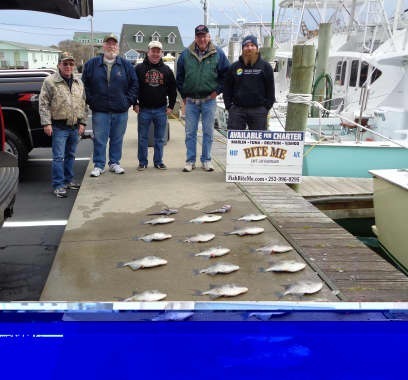 The Red Drum bite was on out in the Pamlico Sound. 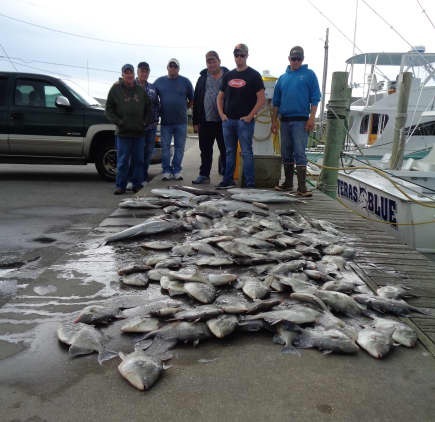 A large school was spotted and almost 2 dozen slot size Drum were caught. Anglers were only allowed to keep one, but the bite was hot and the action relentless. One boat fished offshore. They reported breezy conditions and overcast skies. Bottom fishing was good with Triggerfish, Vermillion Snapper, and Black Sea Bass. Some Blackfin Tuna made it into the box and some King Mackerel were caught on the way in. Don't miss out on the late Winter action - get out on the water and see what you can catch! Another beautiful day despite strong SW winds. 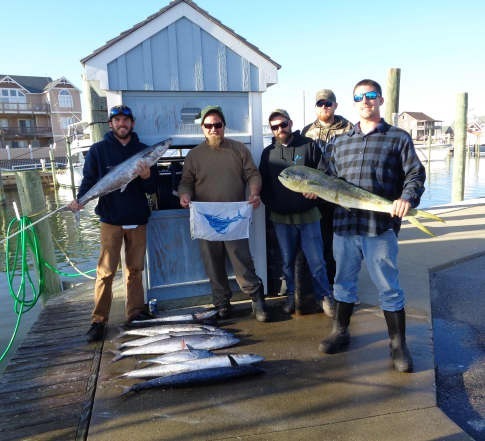 Several charters fished offshore and it was pretty much a repeat of yesterday. The King Mackerel were biting again today. There was also a good Blackfin Tuna bite. A few Dolphin were boated and one Wahoo was caught. Bookings for charters have picked up, so don't miss your chance to go fishing! Give us a call at 800-676-4939. What a beautiful day on Hatteras Island, it's been hard staying in the office. Fog and light winds this morning lead to a gorgeous afternoon with slick calm conditions for the boats return to the dock. Four boats headed out this morning with hopes of catching fish and the captains didn't disappoint. With a wide variety of fish landing on the dock. King Mackerel were the most abundant followed by Dolphin, Blackfin Tuna and even a Sailfish was released.